The ‘entire’ town history in a single room! Multimedial presentation of the Imperial Regalia as central to the context of the city’s history. The eight most important chapters of the history of the city of Nuremberg, from the high middle ages to the present. An exciting spacial installation shows these splendid copies of the so-called Imperial Regalia in the context of the city’s history. 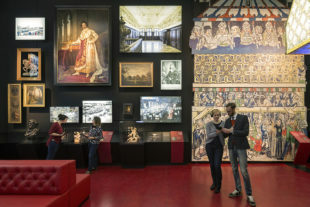 A multimedia guide available in nine languages – unique to the Nuremberg museum landscape to date – explains the most important stages of the city’s history briefly and precisely. 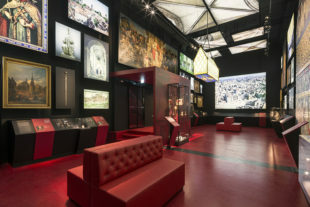 This determinedly visitor-focused component of the permanent exhibition offers 110 square meters of museum experience. This new show aims first of all to target ‘hurried’, time-poor visitors and offer them a very special experience. 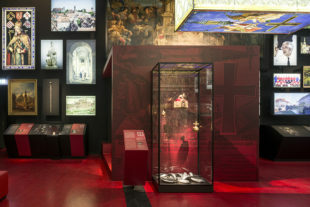 Through this attractive multimedia strategy, visitors can learn, always in relation to the Imperial Regalia, the most important facts about Nuremberg and its grand history – in a little as half an hour. 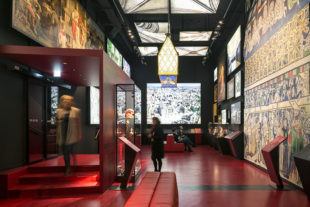 The combination of spacial installation, original objects and layered multimedia explanations make up its great appeal. 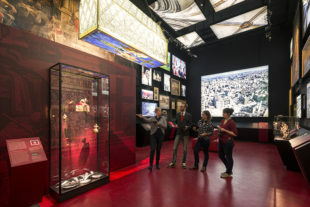 The design concept positions the imperial treasure centrally in the space and accentuates its historical significance through scenographic staging in order to draw connecting lines to the most important chapters of the city’s history. 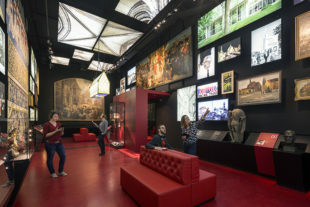 The multimedia concept and the chosen communication channels are ideally suited to centrally deposit all the information required for an exciting and insightful tour of the exhibition on a single mobile device, thus relieving the exhibition space of large text panels. This is to allow the space itself, and the exhibits and images displayed, to create their own impact and cast their spell over its visitors. However, explanations in the form of traditional captions in German and English also guide those visitors who do not wish to use a multimedia guide. There is also an option to use an audio induction loop. Despite its many facets, it has been a priority to ensure that the multimedia guide is as easy to use as possible, and therefore attractive to less practiced, ‘entry-level’ users of digital information as well.